Organization Index to Pension Files of Veterans Who Served Between 1861 and 1900. Make the information on this image better by adding what you know. NARA T289. Pension applications for service in the US Army between 1861 and 1900, grouped according to the units in which the veterans served. 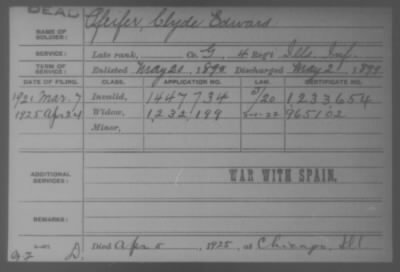 This publication contains index cards for pension applications of veterans who served in the U.S. Army between 1861 and 1900, including wars other than the Civil War. Records are sorted by units within regiments from each state in the Union. Find a soldier by searching on his name or browse by regiment. Learn about his term of service, and use the information to request his pension record. Unique to this series of records are death dates and locations for many of the veterans who died after the war.